Do you have the Deep Feeling, Deep Healing textbook? See your enrollment options above for "I already own the text". The science of psychoneuroimmunology (PNI) investigates the mind/body link. This course focuses on PNI in relationship to body memory. The course will help you better understand the emotional component of your work and facilitate longer-lasting positive results. It does not teach hands-on skills. Internalized Stressors: Who Needs Therapy? Wonderful! So full of insight and useful information. PNI is a very interesting subject for anybody dealing with pain, wich likely includes everybody! This course was informative and in-depth. I thoroughly enjoyed reading the book. I found it fascinating and felt it held much truth. This is an excellent course, very informative, author proves/supports his assortions well. I really benefited by this course and have purchased more copies of the book for people I know who would benefit by its contents. Having a chat room about the contents of this course would be a plus! Lynessa O'Brien L.M.T. & emotional integration. A good read for anyone working in healthcare, and/or bodywork fields, both personally and professionally! This course was so informative, and perfectly timed in my life!! i really needed to learn this stuff right now! This course gave me some concrete reasoning as to why people will release their emotions while I'm breaking up their "pockets of pain" during a bodywork session. Excellent insight into the mind body connection. The course provided me with awareness on how I can further help/understand my clients as well as myself. This was the best course I have ever taken - perhaps it resonates with what I was looking for in my personal healing. Wonderful medical insights - I am a RN, LMT, Reiki Master & HeartMath practitioner - this went much deeper into the power of emotions on physical well-being. Thank you!! 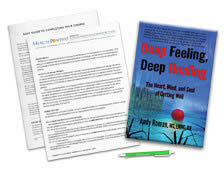 I really enjoyed reading Deep Feeling, Deep Healing and got a lot out of it that I can use in my practice and even more that I can use in my daily life. Thank you. This course really makes you think. I must say I enjoyed it. Thank you. I highly enjoyed and recommend this course! The book for this course was outstanding. The author must be an amazing person. The information was clear, concise, and heartfelt. I was thrilled to study this very relevant subject matter and happy that it was offered. It validated all that I've ever witnessed in my own practice, giving scientific evidence to the understanding that "the body tells the story!" My expectations were, however, that the information would be more biochemical and anatomical in nature as opposed to psychotherapeutical. Regardless, the information was valuable and I would recommend this course to any health practitioner, not just massage therapists. This was my first self-study course. I loved it! It was very insightful, and brought to the table aspects of my practice I can work on improving. LOVE the book!! It was a great read and highly recommended for anyone interested in mind-body therapy. The course was very inlighting to me. Mr. Roman has a very good handle on feeling mind and getting well with heart and soul. This book really helped me to understand why people feel the way they do, it gave me a better understanding of how powerful the mind can be and how the body and mind coralte. Great course... every medically involved human being needs to read and take this course! Fantastic course! Great insights into the mind-body system, the cascading of bio-chemical responses, fragmenting of traumas in the tissues, the role of the heart, electrolytes, hormones and neuropeptides play in the overall health of our amazing bodies. The author presents the science behind body-mind health, thoughtful case studies and great suggested books for further reading. I loved this course! Andy's book is informative and engaging, and was a pleasure to read beginning to end. Thank you! Loved the book. Will reread often. Excellent course!! I am thrilled I found this institute. I cannot speak highly enough of the book, deep feeling, deep healing. Way exceeded my expectations. I have already recommended it to others. Thank you for providing excellent material. This course was exactly what I needed to give me the background and confidence to adequately bring up to clients and people the power of the heart and how our emotions directly reflect our biology. Backed by some really amazing and awe-inspiring scientific studies and case studies! This information is a MUST for every human being to understand! I LOVE this topic and it is going to open many doors for me. Overall, this class was fascinating, and provided me with a strong framework and a language to describe the bodywork I've already been doing. I was hoping for more direct instructions and bodywork techniques about how to apply the theories of PNI in an actual treatment session. More information about the location of and how to activate the endocrine points, etc. would have been appreciated. This course was extremely interesting. If you are a holistic practitioner that is focused on how the mind, body and spirit are connected in healing, this is the course for you! You will understand how suffering, pain, joy and happiness are all interconnected to mental and physical health. Using PNI techniques, a deeper healing can be accomplished with your patients. I definitely recommend this course. This was a great class, building on other knowledge, taking me further, and supporting me in self development and helping others. Thank you! Recognize the author’s descriptions of sanity; how feelings are dealt with in our healing systems, and how important bodily and emotional feelings are for healing and wellness. Distinguish between psychological, physiological, and structural tension in yourself and your clients. Recognize the possibility of elements of fragmented feelings in your own and your client’s experience. Describe how to center yourself in a therapeutic mindset that carries healing intent through your touch. Recognize the boundaries and connectedness between psychological, physiological, and structural tension in yourself and your clients. Identify strategies for a bodywork treatment plan that includes awareness of your client’s feelings and/or life context. Identify the professional roles and boundaries for a bodywork treatment plan that interfaces with body-focused psychotherapy.